✔Gold Armour Advantage - Built-in protection AC outlets, nice for your laptop; smart USB ports with one Quick Charge 3.0 port and one 2.4A port perfect for charging your for your smartphones and tablets. This powerful Universal Travel Adapter Kit can even support powerful devices and perfect for hair dryer, curling iron, iron, and many more electronic devices that can handle dual voltage input of 100V~240V (with up to 2000W total). ✔Dual Voltage Input - Universal 100V~240V, which could be widely used anywhere in the world, ideal for international travel while out of US (Note: This is not a voltage converter). ✔5 International Adapters - UK(Type G), US(Type B), AU(Type I) , EU(Type E/F), IT(Type L) plug compatible with outlets in North America, United Kingdom, Europe, Italy, Chile, Australia, Japan, Africa, MidEast, Asia, China, etc. (Note there is no plug for Switzerland, Brazil, India, Israel and South Africa), please make sure that the voltage of your device is compatible with the countries' voltage where you are traveling to. ✔Designed for Vacation Travelers and Business Travelers - Portable size measuring (3.8 x 2.5 x 1.3 inches), weights 12.5 oz, and comes with a free travel pouch for you to take the charger anywhere you go. 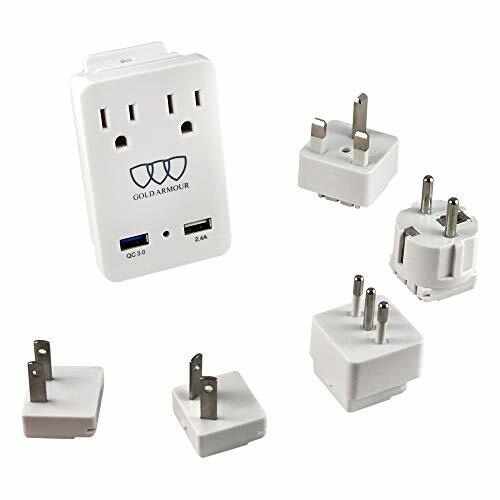 ✔100% SATISFACTION GUARANTEE and 3 YEARS WARRANTY - The Worldwide Travel Adapter is CE, FCC and RoHS approved and comes with a 3 Years limited product warranty. Gold Armour is dedicated to address any product/service issues and is committed to delivering the best experience for all buyers. 3 years WARRANTY included by Gold Armour. If you have any questions about this product by Gold Armour, contact us by completing and submitting the form below. If you are looking for a specif part number, please include it with your message.